(SEOUL=Yonhap News) Ministry of Science and ICT (MSIT) announced on February 12 that it has issued a public notice of K-Global Project, to support the growth and global expansion of startups and SMEs in the ICT sector. This year, 30 sub-projects worth KRW 83.7 billion are to be carried out in various fields including big data, cloud computing, blockchain, and information security. The sub-projects on the list are as follows: "K-Global Information Communication Applied Technology Development Support Project (KRW 27 billion)" to support technology development expenses of ICT enterprises; "K-Global Overseas Expansion Support Project (KRW 5.3 billion)" that provides necessary programs for enterprises possessing superior technologies to enter global markets; "Overseas IT Support Center Operation Project(KRW 5.5 billion )" to provide companies hoping to enter global markets with local business places; and "SW High Growth Club 200 Project (KRW 8.5 billion)" that provides SW companies with funds necessary for commercialization, among others. More detailed information on each project can be found on the website of MSIT, National IT Industry Promotion Agency, and K-Global Project. 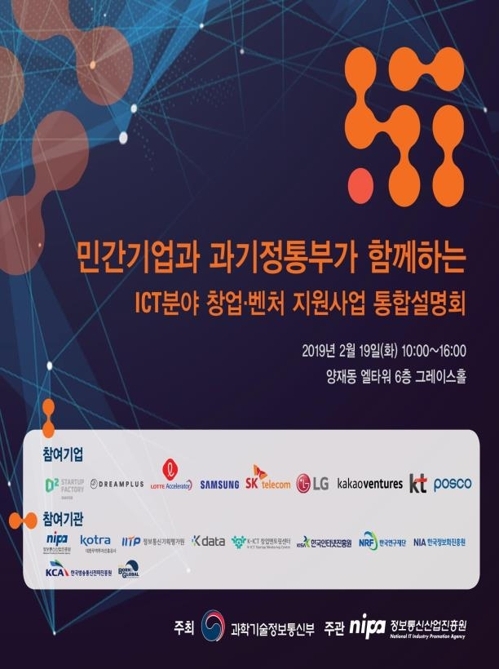 For the companies who want to apply for projects, MSIT will hold a seminar, together with NAVER, Lotte Accelerator, Samsung Electronics, SK Telecom, KT, LG CNS, Kakao Ventures, POSCO and Hanwha Dream Plus at El-Tower in Yangjae-dong, Seoul on February 19.